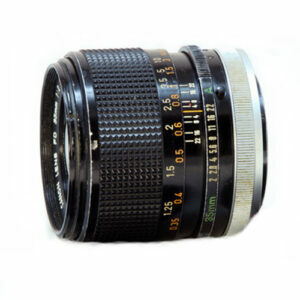 Lens Description: The Canon FD 35 mm f/ 2 S.S.C (II) is a high-quality fast wide-angle lens for Canon FD film SLR cameras.rnrnThis is the second update version of the lens. As different from the previous version, it has a smaller aperture (22 vs. 16) and weight. Besides, this version does not use radiothorium.rnrnEarlier on, Canon lenses of this series used thorium, a rare-earth element. Thorium was added to bulk glass to increase a refractive index ( as a rule, a high refractive index causes high dispersion).That allowed manufacturers to make lenses thinner. In the 1970s thorium was replaced with some other safe elements. rnrnIn due time the Canon FD 35 mm f/ 2 S.S.C used to be Canon\'s standard-bearer. It was one of the first lenses with \"the system of floating elements\".rnrnThe S.S.C. abbreviation (for Super Spectra Coating) means that the then revolutionary technology of lens coating was applied by Canon for increasing optical transmission, decreasing flare, and achieving natural color balance.rnrnThe Canon FD 35 mm f/ 2 S.S.C (II) is incompatible with the modern Canon EF system because of its construction and flange focal distance. I have the 35mm f2 BL FD lens with Thorium glass. The yellowing is hard to see. I bought it to give me a brighter screen on my F1n & EF. Previously I used the f3.5 version which is smaller and lighter. As light abroad is brighter, I take the f3.5 version with me and use the f2 at home. Thus, I’ve not had the problem of the f2 setting alarms off at the airport. I’ve not noticed a lot of difference in results between the two lenses. The f3.5 is sharp and a very capable performer. I much prefer the earlier, chrome monting ring lenses to the later designs. I’m fortunate that all my lenses have 55mm filter threads, this makes filter buying simpler – the later lenses are 52mm. The guy said that already,,, dummy. Learn to READ.